Oil slipped below $53 as China warned that trade wars and populism posed “serious challenges” to the international order, countering signs that the U.S. shale boom is slowing. risks in a speech to the World Economic Forum in Switzerland that amounted to a rebuttal of U.S. President Donald Trump. fast start to the year, crude has moved sideways for much of the last two weeks. Forecasts for weaker growth and the U.S.-China trade dispute have capped gains, said Michael Hiley, head of OTC energy trading at LPS Futures in New York. could weigh heavily on crude consumption, International Energy Agency Executive Director Fatih Birol said. 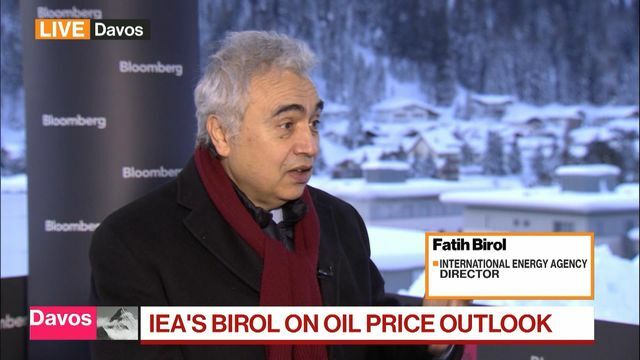 Fatih Birol, executive director at the International Energy Agency, says global oil demand will remain high. West Texas Intermediate crude for March delivery traded 55 cents lower at $52.46 a barrel at 11:45 a.m. on the New York Mercantile Exchange. The February contract expired on Tuesday after slumping 2.3 percent. Brent for March settlement fell 72 cents to $60.78 on the London-based ICE Futures Europe exchange after shedding 2 percent on Tuesday. The global benchmark crude was at an $8.32 premium to WTI. Global oil demand remains on course to expand “above or around” 1 million barrels a day, but the economic outlook remains unclear, especially in China, Birol said in a Bloomberg television interview from Davos. Oil executives at the forum took a similar view. “There’s still so much uncertainty about what’s going to happen with the world economy,” Occidental Petroleum Corp. CEO Vicki Hollub said in a panel discussion. “The volatility I think is going to be worse over the next couple of months” before Brent crude settles in a $60- to $70-a-barrel range, she said. Gasoline futures lost 0.6 percent to $1.3926 a barrel in New York. Pierre Andurand, one of the oil market’s last hedge fund managers, lost 20 percent in 2018 in his fund’s first annual decline since its inception five years ago. Canada’s oil-sands companies are ramping up efforts to get their bitumen to flow through pipelines more easily.